Oh Hallelujah…it is Friday and I for one could not be happier. I realize I’ve said this the past few weeks, but this week has seemed lllooonnnggg! I think it’s the end of the year rush toward the holidays, wishing it was time for Thanksgiving break stress and exhaustion, ha-ha. Not that I’m really exhausted…and I suppose I have little to be stressed about, but there you have it. I’m just really glad it’s Friday and I’m really glad to be linking up for Five on Friday! One. Twisted Peppermint is back at Bath and Body Works and I honestly just want to scoop up the entire shelf. I wouldn’t have thought I’d want to smell like a peppermint but a friend of mine turned me on to this scent last year and I have just been waiting for it to come out again so I could stock up. I currently have three lotions (one for the office, two for home) a body wash, a body spray and a candle. We also have Twisted Peppermint soap at the office because I have introduced my office buddies to the awesomeness that is Twisted Peppermint. Two. Nationals Holiday Packets – that’s right, if you’re reading that and thinking “what in the world” then fear not…because what that means is I already have tickets to THREE Nationals games for the 2016 season! The Nationals are currently offering Holiday ticket packs and you can get tickets to three games next season for as low as $45! You better believe I jumped on that deal, scored myself some tickets and now I’ll be watching the Nationals play the Marlins in April, the Cubs in June and the Rockies in August. If you live in the DC, Northern Virginia or Maryland area and want to check it out, look no further than right here. Bonus: If you buy your tickets before December 11th, you get an ornament! Three. Fitness this week has been interesting…to say the least. I embraced the elliptical on Monday night, we were out and about on Tuesday night and on Wednesday night I really decided I’d jump off the deep end and commit to trying out Jillian Michaels Thirty Day Shred. Oh sweet merciful Lord, I don’t really know why I thought it would be a good idea because I’m two days in and it’s nothing but pain. I’m pretty pleased because I’ve made it two days and stayed committed but man, my legs are killing me…my arms hurt when I raise them too high and my abs (or lack thereof) scream every time I sneeze. So – yea, the fitness is happening. And the fitness might kill me, ha-ha! But – I press on! Four. Tomato Soup & Grilled Cheese is a definite comfort food and at the end of this long week, when it came time to get lunch I knew without a doubt that some delicious and warm tomato soup with a grilled cheese would really hit the spot. So, I did just that and hit up Panera for lunch. 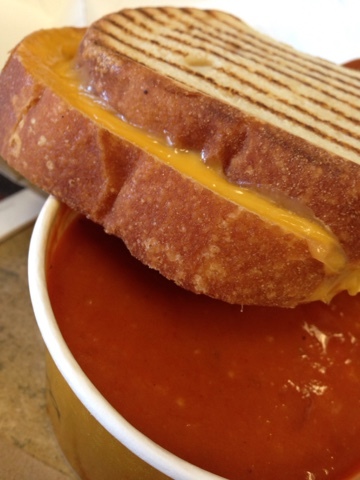 I need to learn to make some really good tomato soup so I can whip this comfort food winner up at my house! Five. 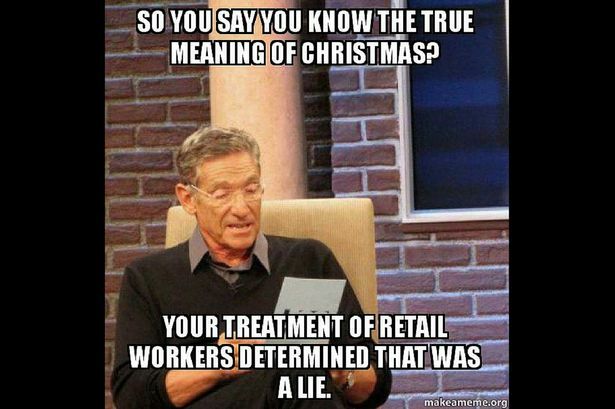 Retail at Christmas is one of those things I’ve been thinking about a lot recently…and thinking about how thankful I am that I don’t have to experience the Christmas season from behind the counter of a retail shop. 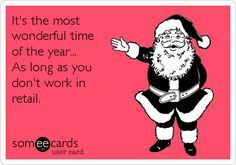 I experienced it last year and somehow at the “best” time of the year, shopping can truly bring out the worst in people. 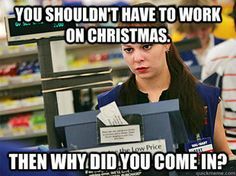 I can remember vividly being yelled at about ornaments and wrapping paper, standing in one spot for over three hours just to ring up people and let’s not even get started on the couple who came into the store on Christmas Eve at 5:59 (we closed at 6) and proceeded to look at every card, not buy a single thing and stroll out laughing at 6:47 – as if we, the retail employees didn’t have anywhere or anyone we wanted to be with on Christmas Eve. 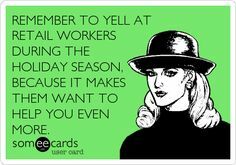 I think it should be a requirement that everyone work retail during the Holiday season once in their life…so….When you shop this Christmas season – try to remember that retail employees are people too; they may be having a bad holiday season or just a bad day – and nine times out of ten, if the store doesn’t have the shirt you want in the size you want, it’s not their fault. Treat all people with kindness. All people. Of course – some funnies…because I couldn’t pick just one. So – that’s my Five on Friday. I hope you have a wonderful weekend – because I certainly plan to!